After legendary gigs at festivals such as MELT! and Monegros, Electronation welcomes Paris based experimental techno dj/producer Popof for a liveset in Melkweg’s Old Hall. His Alcoolic release on Cr2 Records became an international hit in 2007, followed up by his Summer on Mars EP in 2008 featuring my personal favourite Toxic Love. Nowadays, he’s ready to headline venues as the Melkweg, supported by local heroes Terry Toner and Kevin Arnemann. Sounding juicy? Join us at the Melkweg by commenting on this post on Facebook; yes we’re giving away 2×2 tickets! Winners announced on Friday afternoon, cheers. Who hasn’t heard of Joris by now? I’ve always had trouble describing his sound, usually this is a bad thing, but this guy has proven to be such a professional allrounder in the game that I have learned to appreciate his production skills. He just returned from a short adventure through countries like Peru, Brazil and Chile to celebrate his birthday in his hometown of Amsterdam. Go support, he’ll be pulling an allnighter together with Deetron. Jesus, what a line-up: Super Flu, Rodriguez Jr., Jeff Moore, Michel de Hey, Jean Cedric and personal (local) favourites Philip Young & Arjuna Schiks all in one night and more, ’till 9am in the morning. Three halls in Studio K filled with melodic techno and techhouse. I want to meet whoever’s resposible for this line-up, can’t believe this party hasn’t sold out yet. Now that you’ve wrestled your way through these big names, here’s yet another one to consider: Florian Keller. 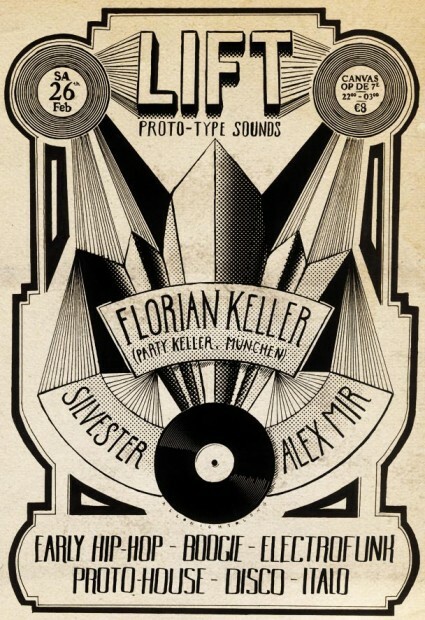 This Munich based DJ is well known for his ‘Party Keller’. With a repertoire extending from original raw funk and block party breaks to boogie, disco, discorap and Hip-Hop, Florian is a all round party champ. So feel like lifting your feet and dancing to some protohouse, early hip hop, electro funk, disco & italo, I suggest you take the LIFT to Canvas op de 7e. First of all, I just want to state I think the monthly concept of ‘Trouw op Zondag’ is genius. You can grab a bite or do a dance with a crowd that’s mixed with both freshly off the boat and ones who have been raving around for the last 12 hours. This specific Sunday brings us Dennis Ferrer, a New York-based DJ, producer and remixer. A veteran of soulful house music production and founder of the Objektivity record label. Label mates Martinez Brothers, André Hommen and resident Melon will support the prolific record producer. Doors open at 4pm, looking forward.